Did you know that October is Breast Cancer Awareness month? Breast cancer is the most common type of cancer that is treated in the United States with over 250,000 new cases being diagnosed each year. It is estimated that this year, 2018 we will have approximately 1,735,350 cases of cancer diagnosed. With this number expected to continue to grow, the techniques used in delivering radiation therapy, the most popular treatment option, are continuing to advance. Radiation treatment for cancers of all types may be delivered externally or internally. With external radiation a beam of high-energy rays is directed towards the tumor from outside of the body. This delivery is most often done using a large piece of equipment known as a linear accelerator or LINACS for short. Internal radiation, brachytherapy, requires the implantation of seeds containing radioactive material to be place in or near the cancer. Another method of delivering radiation in cases of cancers like that found within the thyroid is sent directly into the vein. 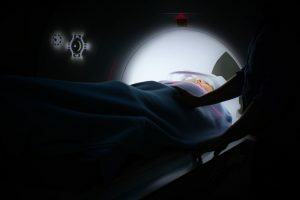 Treatment options for cancer continue to advance as better methods are found to deliver radiation without causing harm to healthy cells surrounding the cancerous tissues. Linear accelerators are used to deliver external beam radiation therapy. Radiation is delivered from outside of the body by penetrating cancerous cells with high-energy external radiation beams. This dense radiation beam is used to kill or shrink the cancerous tumor without harming healthy tissues. Linear accelerators allow for a more precise treatment of radiation which leads to fewer side effects. EBRT is most often prescribed on an outpatient basis for upwards of eight weeks. Another method of EBRT is done using a specialized computed tomography scan, CT scanner and targeting computer. This radiation treatment gives oncologists the ability to perform three-dimensional conformal radiation. This type of therapy reduces damage to healthy tissues while delivering a higher dose of radiation to the target area. IMRT is another three-dimensional option in radiation therapy. It gives the oncologist the ability to customize the doses given to each area of the tumor. Using computer-controlled sections that are movable, radiation is delivered. The sections are used to adjust the amount od radiation that is given at any one time. They can block or allow radiation beams through to the treatment area. The sections are adjusted to the size, shape, and location of the tumor. It is similar to an adjustable showerhead where the streams of water can be adjusted, some areas offer thicker streams than others. IGRT is a fairly new radiation treatment. This type of therapy involves a number of images to be taking during the radiation treatment. Computers compare the original images that were taken during the planning phase with the images that are coming through during treatment for comparison. This allows the patient’s body position to be adjusted to shift treatment to the exact location of the tumor. This treatment increases the accuracy of radiation while providing documentation within degrees of accuracy. Image-guided radiation therapy can be used along with EBRT, 3D-CRT, and IMRT. Treatment using intraoperative therapy is delivered directly to the cancerous tumor during surgery. This allows a higher dose of radiation to be delivered directly to the cancer while decreasing the exposure of radiation to healthy tissues. These healthy tissues can be moved and shielded during surgery and exposure to radiation. IORT is often used in cancers that are localized, difficult to remove, and have a high risk of reoccurring. Brachytherapy is also known as internal radiation. Seeds of radioactive materials are implanted directly into or near the cancer. This type of radiation therapy is often given when an additional dose of radiation is needed during EBRT but can also be used alone. Overtime if the seeds are not removed the radioactive material will diminish, it can also be removed after a specific period of time. This is dependent on the treatment plan for each unique patient and cancer. Often Brachytherapy is used in treating prostate, cervix, uterine, vaginal, head, neck, and breast cancer. Most widely used in treating brain tumors, arteriovenous malformation, and other selected conditions, SRS is a non-invasive option. It delivers a high dose of radiation to a super defined area. This type of radiation treatment delivers what is normally spread out amongst weeks of treatment in just one single treatment. It can also be in a fractional manner over just a few weeks. Next: Next post: Just How Important is a Contact Page to a Website Afterall?